Sweet butternut squash and carmelized onions with a tangy coconut lime sauce, garlic-roasted chickpeas, and quinoa. This dish is seriously the perfect combination of flavor, texture, and nutrition. My husband has decided to not eat meat for a couple weeks, and i've decided to do it with him. I don't think that meat is bad (although I do believe it should be eaten in moderation), but I'm just trying something different that forces me to get more creative with cooking plant-based meals. To tell you the truth, I've been way more in love with the flavors in some of my plant-based meals than those with meat! This one in particular has been a family favorite. Preheat the oven to 425. Chop the butternut squash into small 1/2-inch cubes. Place on a large baking sheet with olive oil, salt, and pepper. Bake for 25 minutes, or until soft. While the squash is roasting in the oven, chop the onion and begin cooking the quinoa on the stove. Sauté the onion over medium heat. Once the onions become slightly translucent, add the chickpeas and garlic. Continue to cook for about 5 minutes. To make the sauce, combine all of the ingredients in a blender or food processor and blend until smooth. 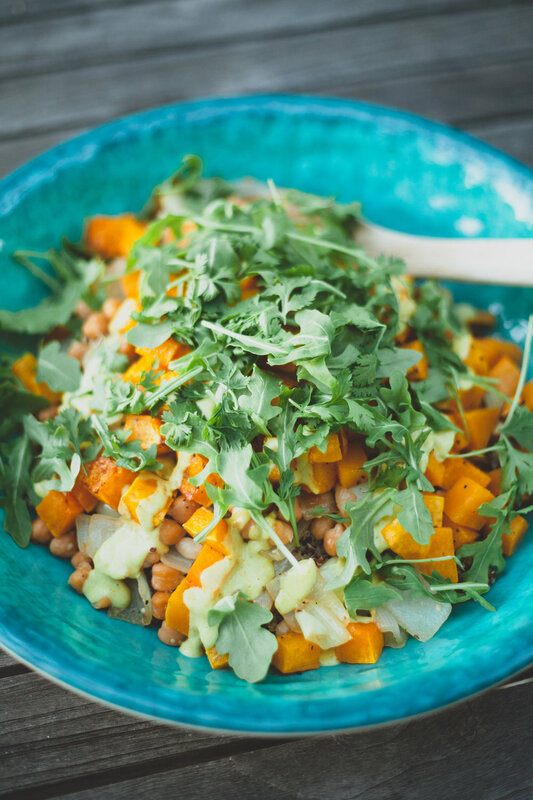 Place the squash, onions, chickpeas, arugula, and pumpkin seeds on a bed of quinoa. Drizzle the sauce over the top and enjoy! Sign up with your email address to receive recipes and blog posts.